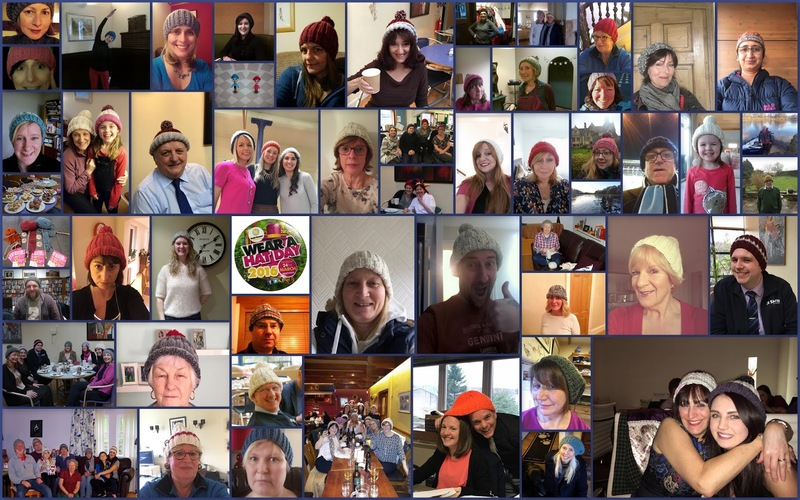 Every Picture tells a story and the #Hattastic Gallery shows some of the hats knitted and bought in aid of Brain Tumour Research. To begin with I was a bit unsure if it would work. I set my Just Giving Page target to £250 thinking I might get lucky. But who would buy my hats? I lined up a couple of friends to sell them for me but seriously expected to have to donate the remainder to the homeless. How wrong could I be. Within hours of launching the Big Knit Challenge I had orders flying in through Facebook. CR Smith colleagues old and new stepped up to the mark and many people who have been affected by this terrible cancer. I was overwhelmed. And then came the offers to help knit. Four CR Smithies took up the needles and joined in. They also organised a coffee morning on the Wear a Hat Day to sell their hats. Fiona did a great job of spreading the word about the charity. She is a popular girl and as soon as people knew the challenge was to help her the Just Giving page rose, and rose and rose… As soon as the donations slowed Fiona began spreading the word further afield.